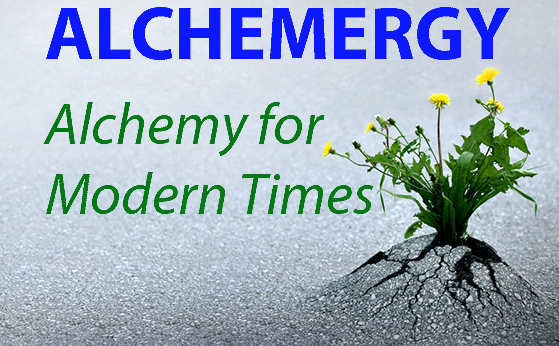 Alchemergy ("al-chem-er-gee") is transformational podcasting for those looking to create real change in themselves and the world around them. In our podcasts, we focus on the merging of ancient and modern traditions and the emerging of new paradigms for our times. The principles of alchemergy have been part of depth psychology for over fifty years, and many modern thinkers have applied alchemical ideas to consciousness studies, quantum physics, addiction treatment, filmmaking, and more unexpected areas. All these are potential topics for our podcasts. In practice, Alchemergy is the cross-union of opposites on all levels – science and religion, Eastern and Western philosophies, feminine and masculine, feeling and thinking, Soul and Spirit. The Child of the Philosophers that results from this union is the Philosopher's Stone – which the alchemists saw as a higher state of consciousness. But achieving lasting transformation on any level is no easy task. Wishful thinking, egocentric beliefs, generational dogma, and simplistic discipline always fail. The challenge of change can only be surmounted by a deeper understanding of the universal principles involved – the archetypal patterns hidden all around us. Since ancient Egypt, philosophers have been seeking those principles and working to understand how they can be applied. They created a powerful Art of Transformation, a spiritual technology known as alchemy. The birth of alchemy in Egypt dates back at least as far 1500 BCE. Some say its origins go back even further to 10,000 BCE, a time known in the ancient texts as Zep Tepi, when enlightened beings roamed the earth and shared their knowledge with mankind. These principles were considered so powerful that they were expressed only in secret writings or concealed in arcane drawing and symbols. That tradition was carried on during the heyday of alchemy in the Middle Ages in secret ciphers, symbolic drawings, and in the sacred architecture of cathedrals. The gold of alchemy, according to this deeper tradition, is simply hastened perfection – inner and outer – the divinization of both human beings and matter itself. The Great Work of alchemy has always been to speed up the natural process of perfection and resurrect the spiritual essences that are trapped in matter. Every human being participates in alchemy, whether in a conscious manner or through the suffering of worldly experiences that finally lead to increased spiritual awareness. Alchemy is really a Science of Soul, a unique discipline that is not merely an intellectual but also an intuitive science. That is not to say that alchemy does not deal with material things, for the alchemists saw spirit and matter as two opposite poles of an eternal One. Alchemists worked with substances in a unique way unlike modern chemists, who mechanically recombine atoms and molecules into new compounds. Alchemy, on the other hand, causes that which already pre-exists in a latent state to become active and grow. So, alchemy is both science and art – and as every artist knows, true art can only be practiced by those who are in possession of the inspired presence and purified imagination necessary for creative transformation. While the manipulations required for alchemical operations may, like the techniques of chemistry, be taught to anybody capable of reasoning, the results that such a person could accomplish would be without life – an alchemical still-birth. For only the person in whom the true life has awakened can in turn awaken and cause visible forms to grow and the metals of the human temperament to be transformed. Dennis William Hauck is a researcher, author, and lecturer in consciousness studies. His primary focus is on levels of awareness and the mechanisms of transformation of consciousness. He works to document the evolution of a science of consciousness and merge various philosophical and scientific traditions into a unified theory of consciousness. He has also contributed to related areas, including the history of science, psychology, and the serious study of paranormal and mystical experiences. He is considered a leading authority on alchemy and hermeticism. “For Hauck, classical science has its limits, in that it can explain only our physical reality, not the deeper hidden reality from which the physical stems. He decided that alchemy offered one path to that hidden reality, and so, knowing that this path of discredited ‘pseudoscience’ might forever taint his career, Hauck decided it was worth the risk to discover solid evidence and challenge the dominant Newtonian paradigm." “The Stone exists in the formative realm between energy and matter, suspended in the twilight between what exists and what does not exist. Since the eighth century, alchemists have been describing the brain as a magical touchstone made from a hidden etheric substance that is distributed throughout the universe. That substance is consciousness." If you become a patron to Alchemergy, you’ll immediately get access to as many as 0 patron-only posts. Advertising and paid aps to increase publication effectives and subscribers.